Today my parents and I ate out after running some errands. While my dad got a salad and some beans with rice and beef; my mom ate soup and chicken stew. 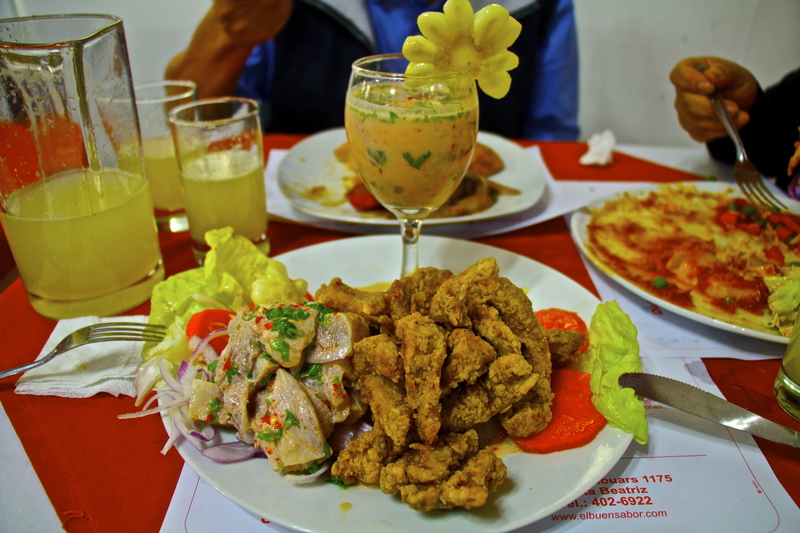 I ordered a “Ronda pirata” -a combo of ceviche (raw fish marinated with key lime juice plus red hot chili peppers, onions, corn, sweet potatoes, and, in this case, a bit of cilantro,) fried fish, and “leche de tigre” (a variation of ceviche having extra key lime juice.) Ceviche is probably the Peruvian food I miss the most when I’m in the States so my order was not surprising. It was not the best ceviche I’ve recently eaten; as a matter of fact, it was just fine. However, every time I can get one here in Peru, I’ll definitely definitely definitely just go for it!